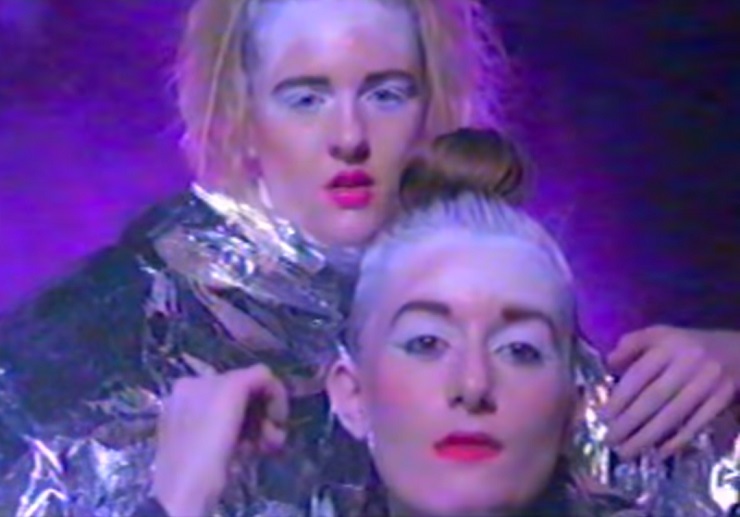 "Debauchery is not what is used to be," if you believe what Vancouver electro-pop duo Mu are singing on their newly released II EP, but the pair seem to be having a hell of a good time in the video for the release's "Debauchery." Grainy footage of a glitter paint-coated outdoor dance party for the single can be seen online now. Scored by the digital dream pop tune, the clip finds the band's Francesca Belcourt and Brittney Rand gleefully wheeling themselves down a street, and followed uncomfortably closely by a semi truck. Once they make their destination, they hook up with a series of late night dancers covered in gold face paint and electromagnetic-reflective coats. Whether or not they're twisted up on anything other than good vibes is besides the point, you'll find Mu's display of "Debauchery" down below, courtesy of Beat. II was released today (February 12) through Boompa Records.